When extreme cold or hot temperatures bear down, your home's interior may suffer if the structure's thermal envelope is not properly doing its job. Cold and heat can enter your home through a myriad of avenues. But before you look at large expanses like walls, ceiling, and flooring, consider smaller intrusion points that are the more likely culprits: windows. Extreme temperatures can press into your home both through and around windows, even with quality windows that are in good shape. Not only is fenestration a major area of thermal loss, but it is also one of the easier areas to repair. Insulating windows, a simple and inexpensive project, can reap huge benefits for your comfort level and for your monthly energy bill. While insulation cannot transform a bad window into a high-performance window, it can make a marginal difference to get you through a season or two. Newer, top-quality windows may not require the entire array of insulating techniques suggested here. But they too can benefit from an additional measure or two, such as the installation of insulating draperies. Employ any or all of these window insulation techniques as needed. The cost of insulating windows should not be an obstacle since most of these methods are inexpensive. 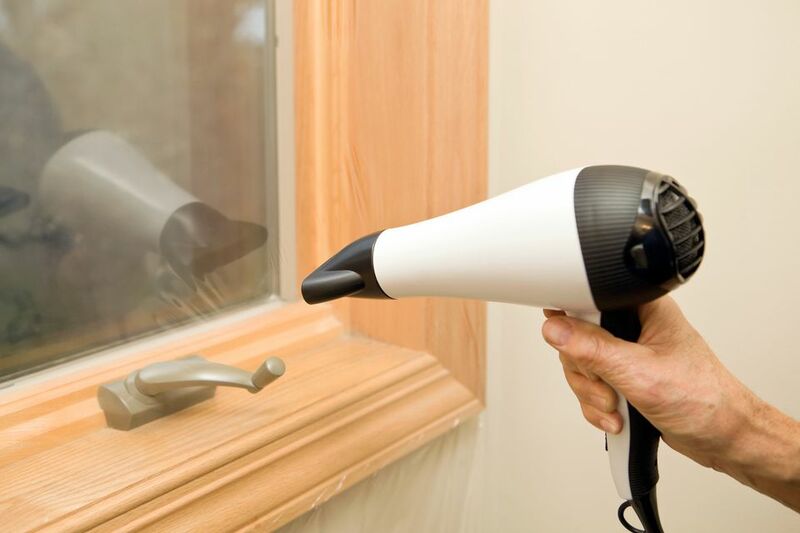 Shrink-fit window film insulation, caulking, weatherstripping, and spray foam are so inexpensive that you can recoup their costs in energy savings over one or two seasons. Draft stoppers can be created from old fabric and grains. Of all of the methods, energy efficient window treatments are the most expensive, costing up to 25-percent more than ordinary, non-thermal window curtains. Transparent window film comes in large sections that are pre-cut to the window size. The film attaches to the outside of the window frame with double-sided tape. Lightly blowing warm air over the film with a hair dryer tightens the film. Acting much like the argon or krypton gas that fills the space between double-glazed window panes, the dead air pocket created between the film and the window hinders air and thermal infiltration. Window film insulation is different from reflective window film (or low emissivity film). Reflective film sticks directly on the glass while window film insulation must remain away from the glass. Window film has been proven in laboratory tests to lower a window's u-value by up to 13-percent. Upon removal, the double-sided tape may strip off paint from your window frame. Homeowners often find that they need to re-paint parts of their window trim after the window film has been removed. When you have cracks in the window sash or around the window that are 1/4-inch wide or less, squirt the area with water-based latex caulk. Use silicone-based caulk for metal and glass surfaces. For sections that you intend to later paint, use paint-quality caulk since not all caulk (notably silicone) can be painted. Caulk is inexpensive and easy to apply. All caulk periodically needs to be reapplied, especially if the window area is subject to expanding and contracting. So, expect that you will likely need to strip away and re-caulk these areas after just a year or two. Stationary parts in or around windows can be filled with EPDM, foam, or felt weatherstripping. Movable parts of the window, such as the gap between the sash and the window frame, also can be filled with weatherstripping on a temporary basis. Unroll the weatherstripping and force it into place with your fingers. If you have to force in the weatherstripping, use a blunt object like a paint stirrer as a sharp item like a putty knife may slice the weatherstripping. Weatherstripping is simple to apply and will leave no residue or mess when removed. When applied to movable window parts, the window cannot be opened or closed. If you do wish to open the window, the stripping must be removed, then applied once again. Often, this is an acceptable solution since windows tend to remain shut during the winter anyway. Large, accessible gaps around the window frame should be filled with polyurethane, expandable spray foam. Insulate with spray foam only if you already have access in the form of large holes or cracks. Stripping away drywall and plaster to gain access often will create more problems, so be sure to balance the expected work against energy-saving benefits. Aided by a long nozzle, spray foam can reach areas that you cannot reach by inserting fiberglass insulation by hand. Rarely will you have enough full access to the wall cavities around the window. Spray foam is difficult to control and can expand out of the wall cavity, onto the wall or floor, so be sure to purchase low-expansion foam. Window treatments that provide extra insulation tend to come in two forms: thick side-drawn draperies or vertically-drawn pleated (or cellular) blinds. The draperies are far thicker than ordinary ones and have tie-backs to hold them against the wall, further blocking air infiltration. Pleated blinds that move up and down look like typical mini-blinds at first glance. Yet extended, their cellular construction forms air pockets that help maintain inside temperatures. Recommended by the U.S. Department of Energy, research has shown that insulating window treatments are highly effective at controlling inside temperatures. During hot months, draperies with white plastic backings can bring down the home's heat gain by about 30-percent. Insulating draperies and blinds only work when closed. Pleated blinds do little to control air infiltration since they are too light to prevent air from moving into your home. Often used to block the gaps under doors, fabric draft stoppers, or draft snakes can also block the gap between the bottom of the window sash and the window frame. You can make your own draft stopper from long socks or sewn from fabric. Rice, popcorn, or dried beans are used to fill the snake. Draft snakes have very few downsides since they are so inexpensive and easy to make or buy. Just understand that they block only one of four potential draft points along the perimeter of a window sash. Ideally, you should insulate your windows before cold weather sets in. On the other hand, because it is difficult to assess the state of windows' insulating abilities when temperatures inside and outside are nearly equal, you may wish to wait until it is time to start cycling on the heat or air conditioner. This contrast between inside and outside temperatures will be greater at this time. Also, if you choose to use a thermal imaging camera, the camera will register heat or cold loss patterns better at this time. Are You Committing Any of These Curtain Crimes?